UK Bus Company to Accept Open-Loop Payment from Cards and NFC Phones | NFC Times – Near Field Communication and all contactless technology. 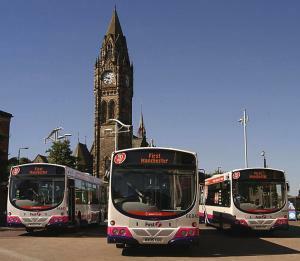 The United Kingdom’s largest bus and rail operator, FirstGroup, has announced it will enable bus passengers to pay fares with contactless credit and debit cards and NFC phones starting in late 2012. FirstGroup, which bills itself as the largest bus and rail operator in the United Kingdom, is following Transport for London's lead in planning to accept bank cards, as well as NFC phones, directly to pay fares. The company said it is rolling out technology that will enable passengers to tap their contactless credit or debit cards or similar applications on NFC phones throughout its bus operations in England starting in late 2012. It is reportedly equipping about 5,000 buses to accept the contactless payment, including in such major cities as Manchester, Leeds and Southampton. All told, FirstGroup has about 8,000 buses and carries 2.5 million passengers a day in more than 40 towns and cities in the United Kingdom. The company said it is investing £27 million (US$43.8 million) in the new ticketing system. The buses will also be able to accept smart cards complying with the UK ITSO fare-collection standard. ITSO functionality will be introduced in the fall, about a year before the buses will take contactless bank cards and applications on NFC phones. London transit authority Transport for London plans to equip more than 8,000 buses to accept contactless credit and debit cards earlier in 2012, in time for next summer’s Olympic Games. It will follow that by accepting open-loop payment on the London Underground, planned to launch before the end of 2012. The open-loop transit payment is expected to offer a big boost to the United Kingdom’s contactless-payment rollout. At present, about 60,000 contactless point-of-sale terminals accept contactless bank cards, though few are large retail chains. There will be an estimated 25 million contactless credit and debit cards on issue nationwide by the end of 2011, according to forecasts. The United Kingdom has the largest rollout of contactless bank payment in Europe. Transit authorities in such other cities as New York, Chicago, Philadelphia, Washington, D.C., and Toronto are also gearing up to accept open-loop payment. Giles Fearnley, managing director of FirstGroup’s UK bus division, said in a statement that the new system would simplify bus travel and introduce a maximum daily fare. “The public transport industry will increasingly rely on new technology, such as contactless bank cards and mobile phones to both retain and attract customers,” he said. With contactless bank cards, the back-end system calculates the fares and bills users for the proper amount or deducts it from their bank accounts. With prepaid transit cards, such as Transport for London’s Oyster scheme and ITSO, readers calculate the fares and deduct the proper amounts from cards. The FirstGroup open-loop ticketing system will accept contactless credit and debit bank cards and similar applications on NFC phones, but not prepaid bank applications, at least not at first. That is also the case for Transport for London, since streamlined authorization is not ready for prepaid bank applications. The first NFC rollouts in the United Kingdom, however, will be using bank-issued prepaid applications, including Quick Tap from Orange UK and Barclaycard, which has already launched. Telco Telefónica (O2) UK is planning to launch NFC before the end of 2011, featuring its own prepaid payment application. The transit terminals will not be able to accept fare payment from these applications.